Are you sensual? Do you seek out pleasure? Do you love cats? If you do, you have a lot in common with our next Egyptian Zodiac Sign, Bastet. 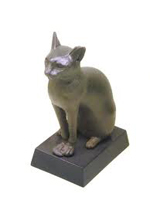 Characteristics of the Egyptian Zodiac Sign Bastet: If your sign is Bastet, you are very perceptive and can see to the heart of the matter and the essence of people. Keeping your life balanced and smooth-flowing is important to you. This extends to your relationships with others where you try to maintain the peace and avoid confrontation. It's easy for you place your needs second to those of others, which can cause stress and problems at times for you. However, you possess great strength and flexibility which allows you to juggle many things, overcome obstacles, and to recognize problems before they begin. At times, you can appear psychic, possessing great knowledge about events at work and in your relationships. You enjoy life and structure it around things that please you. You are very sensual and enjoy the finer things in life. Your pursuit of joy doesn't make you a pushover. While you are quite loving and gentle, you are more than willing to show your claws to protect yourself and those around you. About the Goddess Bastet: The history of Bastet is a story of Greek influence on Ancient Egyptian culture and Egyptian Astrology. When the Greeks started ruling Egypt, they incorporated parts of Ancient Egyptian culture and beliefs, but changed them to fit their own beliefs. Bastet began as a Sun Goddess who looked like a lionness. She was the protector of Lower Egypt, making her the defender of the pharaoh and the God Ra. She was one of the “Eyes of Ra,” making her an avenger God who slew Egypt's enemies. She was the mother of Anubis and the goddess of perfume (a connection to Anubis' role overseeing mummification). After the Greeks ruled Egypt, Bastet was replaced by Sekhmet, a Goddess of war who looked like a lion. Bastet's appearance changed from that of a lion to either a domestic cat or a woman with the head of a cat or lion. She transformed from a Sun Goddess to a moon goddess, similar to the Greek Goddess Artemis. She was no longer the mother of Anubis, but now the sister of Horus and daughter of Isis and Ra. Her role in Ancient Egyptian religion was also relegated to a goddess of cats.